Naturally my tea sandwich for the week is one of those I made for yesterday's Royal Wedding Breakfast Tea in honor of the nuptials of TRH The Duke and Duchess of Cambridge. 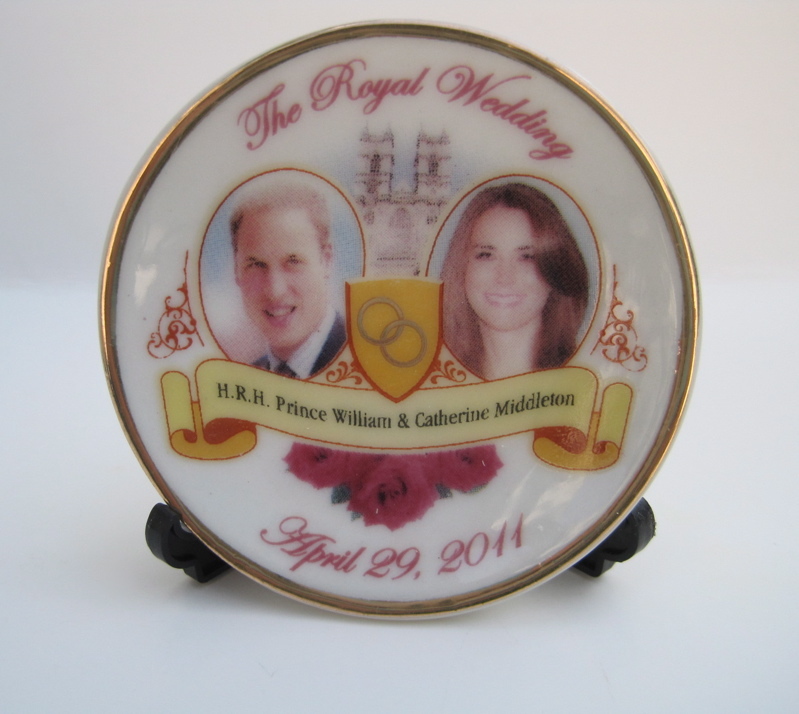 (TRH stands for "Their Royal Highnesses" -- I had to noodle that one out!) 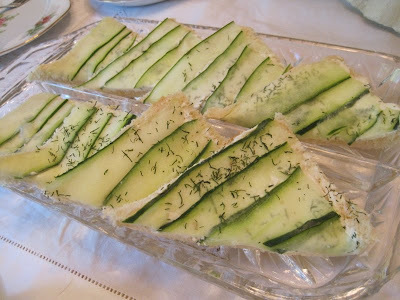 At my house it's not a tea party if you don't have cucumber sandwiches, but for such an occasion as this I couldn't just slice little rounds of cucumber and call it a day, oh no. That simply wouldn't do. 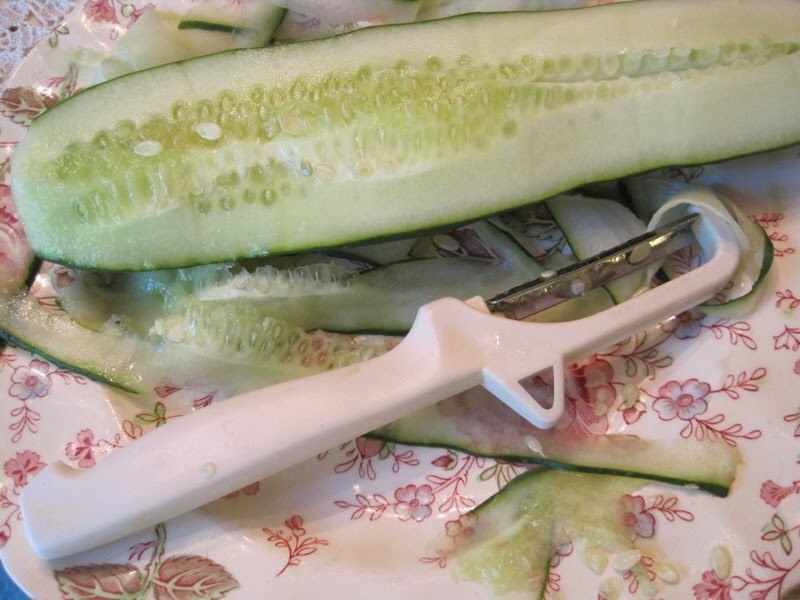 These needed to be *special* cucumber sandwiches. So here's what I did: I used a knife to slice off a bit of cucumber skin, and then I used my vegetable peeler to slice off paper-thin strips of cucumber. 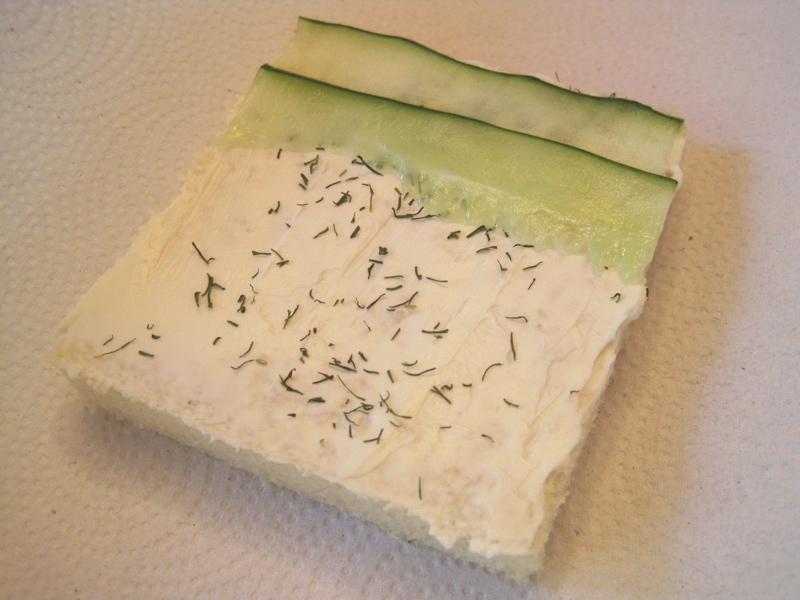 Using frozen slices of plain white bread (frozen for easier cutting and prettier slices), I spread the bread with a thin layer of cream cheese, sprinkled with a bit of dill and then started adding strips of cucumber. 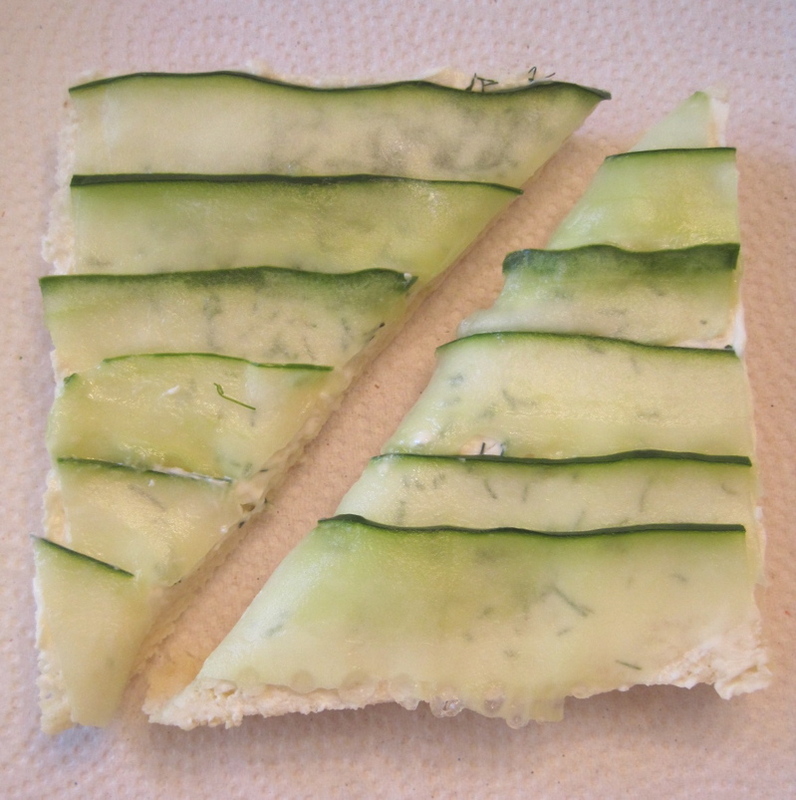 When I had covered the entire piece of bread, it looked like this. 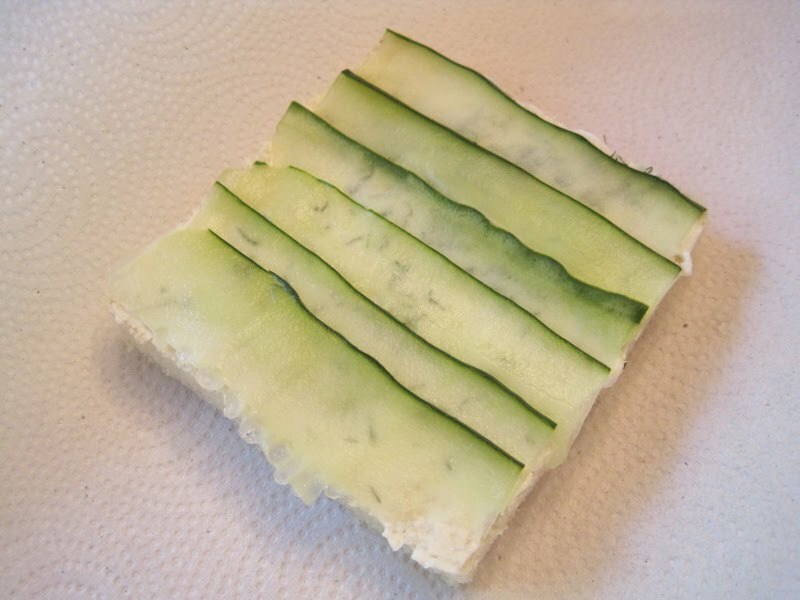 Then I cut the slices in half diagonally, and there you have it, cucumber sandwiches that look a bit more formal but are incredibly easy to make! And I'm a wee bit excited! Gift bags are ready. Do you think grown women are too old for princess wands? No, I didn't think so. Details and photos coming Monday -- if I can wait that long! I broke them up into bite-size pieces as the recipe says, added nuts (I used walnuts), raisins, and a mixture of chocolate and sweetened condensed milk, poured it all into a pan and let it cool, then topped it with more chocolate. 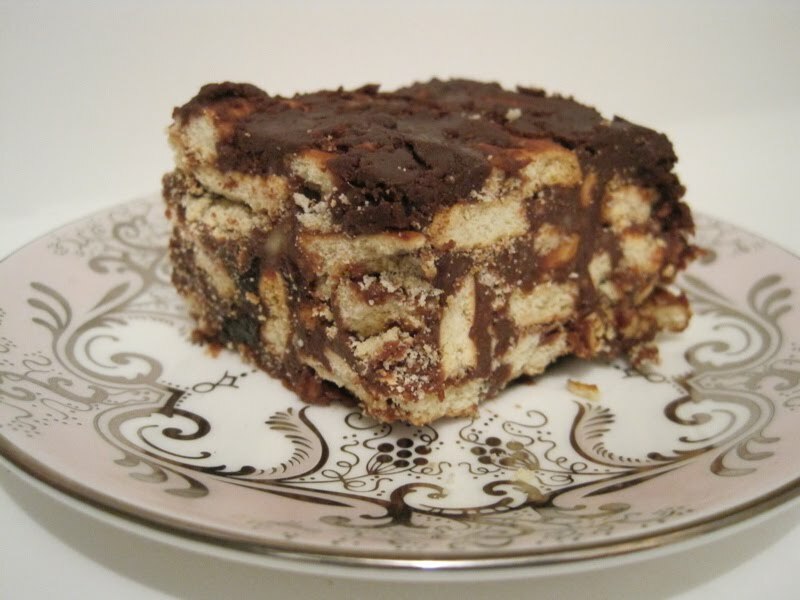 The link above said William has been criticized for what some consider his "lowbrow" cake choice, which Tea and Sympathy describes (admiringly) as "a souped-up Rice Krispies treat." I think it's way better than that. More like a Twix bar but without the caramel. 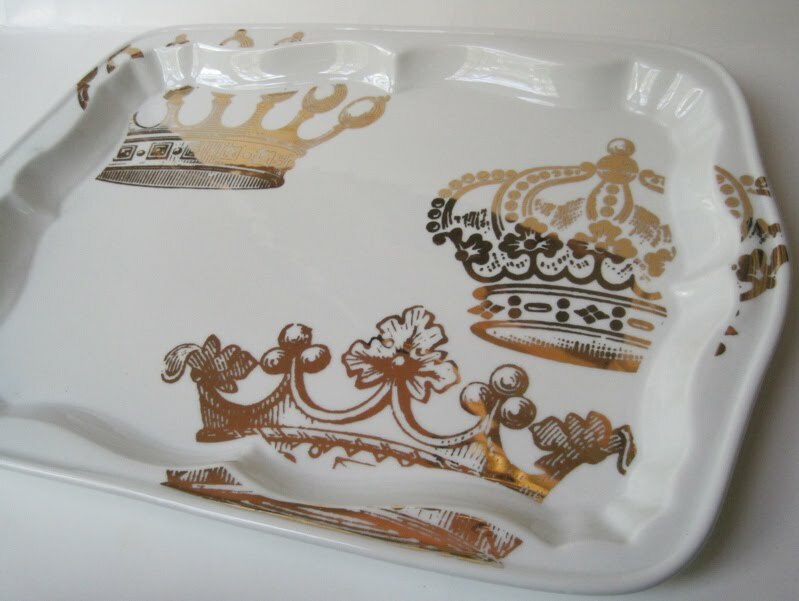 At any rate, my tea party guests may look askance at the odd little squares I will be serving on Friday, but they will truly be able to say they ate like royalty at our tea party! A crowning achievement ... in decorating! 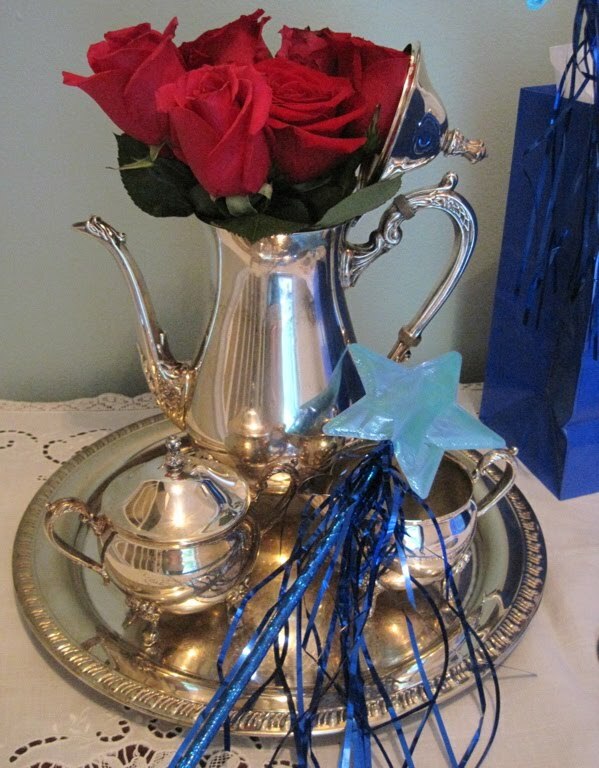 Since the Royal Wedding is so early, I decided to call my event a "Breakfast Tea." 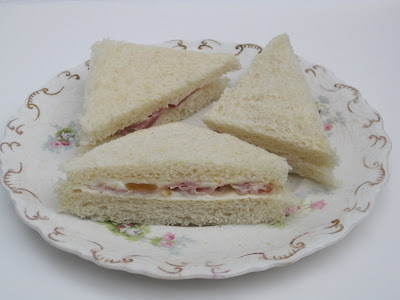 The plan is to have breakfast foods in the living room while viewing the wedding, and once we've spent a few hours discussing the nuptials we'll move to the dining room for scones, finger sandwiches and other typical teatime fare. 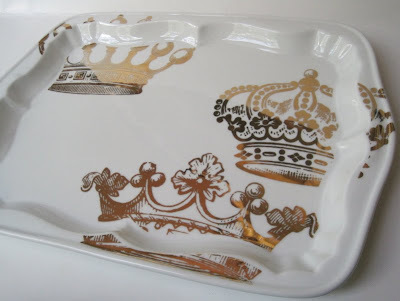 I wasn't sure what sort of plates and dishes to use for the "breakfast" portion of the day, but fortunately my shop-owner friend Liz had pulled some great pieces for me and said not to feel obligated, but would I like to borrow them? YES! 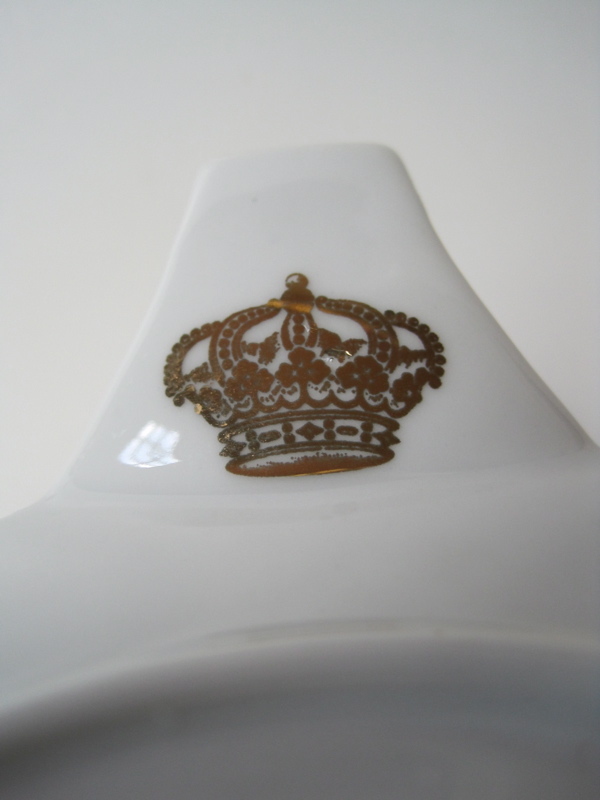 A teapot with a crown on it is absolutely perfect! There's even a tiny crown on the spout! 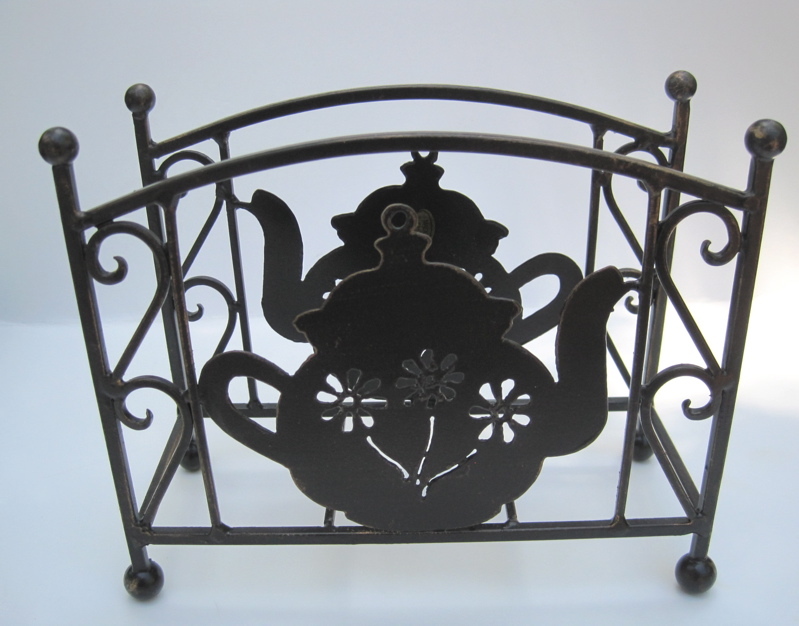 The matching tea tray will be perfect for serving mini-muffins and breakfast breads. Mugs can hold tea or coffee, which will both be served, and there are matching dessert-sized plates as well. Liz also found some decorative crowns I'll be using. 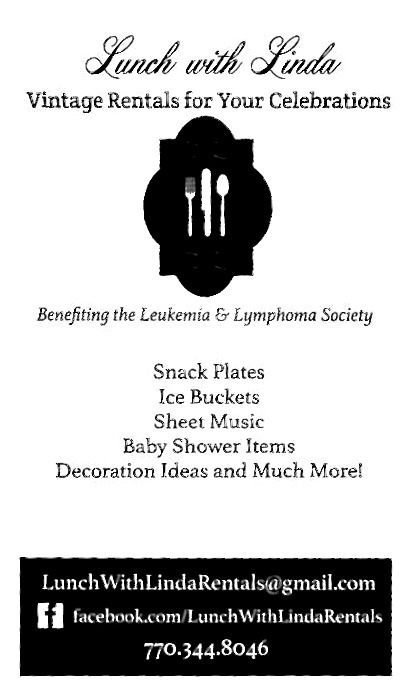 This will either be the cutest or the most over-the-top tea party I've ever hosted, but either way it's going to be fun! Bless the good people of Harney and Sons for giving us a Royal Wedding Tea blend with which to celebrate the upcoming royal nuptials! 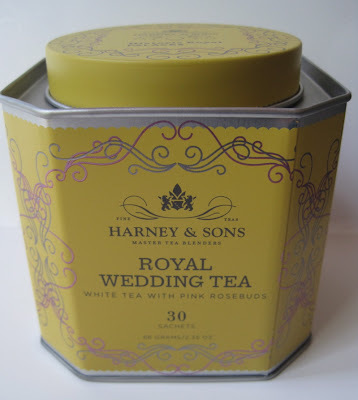 I ordered a tin the minute I heard it was available, because of course I wanted a "tea souvenir" of the wedding and Harney is certainly a name I know and trust. The teabags are so pretty! 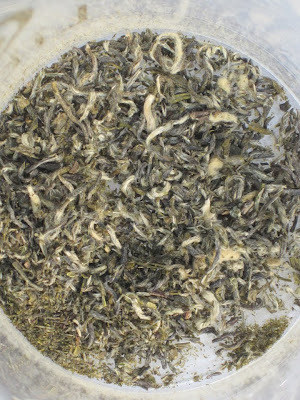 This white tea is flavored with almond, coconut, vanilla — and rosebuds and petals, which you can see inside the bags. 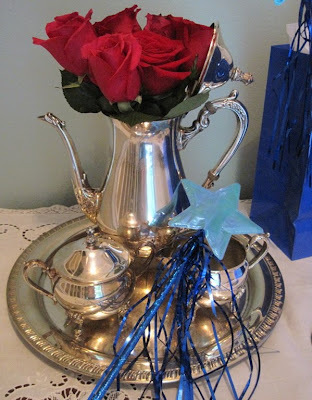 I was pleased the rose flavor is so very subtle, because while I happen to like the flavor of roses, some of my tea party guests may not, but this mildly sweet tasting tea will be a hit, I think. 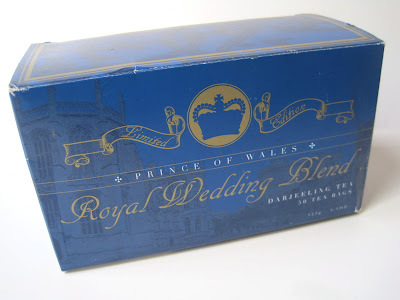 This isn't the first time I've celebrated a Royal Wedding with a special tea blend. Prior to Prince Charles' wedding to Camilla in 2005, I ordered a box of this Prince of Wales Royal Wedding Blend Darjeeling from the British Tea Company and sipped it as I watched the ceremony. Amber S! 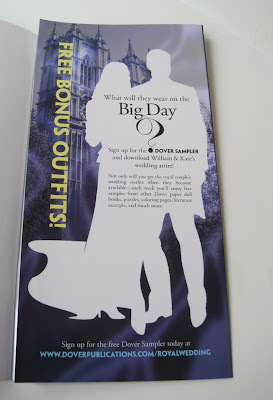 If you'll send me your snail mail address via the e-mail button at right, I'll let the company know you are the winner! Congratulations! Yes, friends, the week so many of us have been waiting for is finally here! 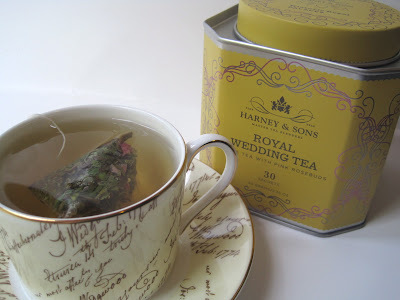 I have been talking about hosting a Royal Wedding Tea for years now, and my girlfriends and I are so excited! I've already got some baked goodies in the freezer, the decorations are ready to go, and I'm almost through finalizing my menu, so bring on the Royal Wedding! 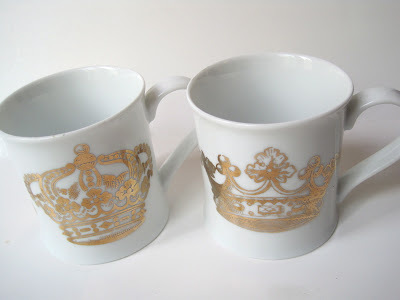 For my fellow fanatics, I wanted to share some of the Royal Wedding goodies I'll be using to help celebrate. First, I was thrilled to finally find these Will and "Ka-tea" tea bags I've been reading about for months now! 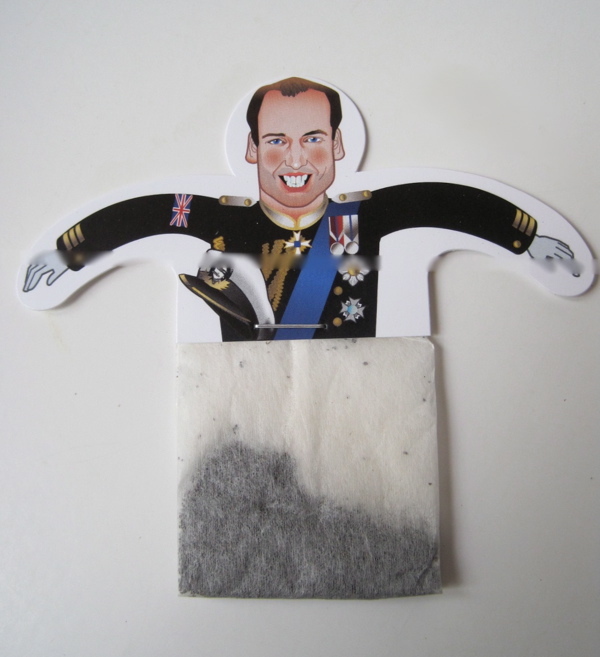 I'm sure most of you royal watchers, like me, have seen these teabags in news stories online, but I wasn't prepared to pay the cost of ordering them from the maker in Germany. Happily, Books a Million had a whole table of Royal Wedding goodies and that's where I found these. 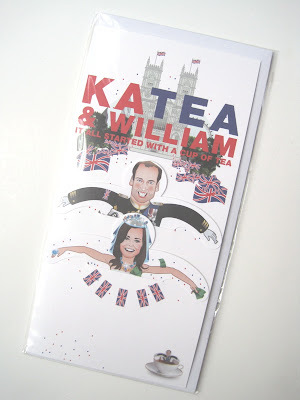 ... perhaps you prefer Kate, who looks rather like she's in a hot tub, doesn't she? 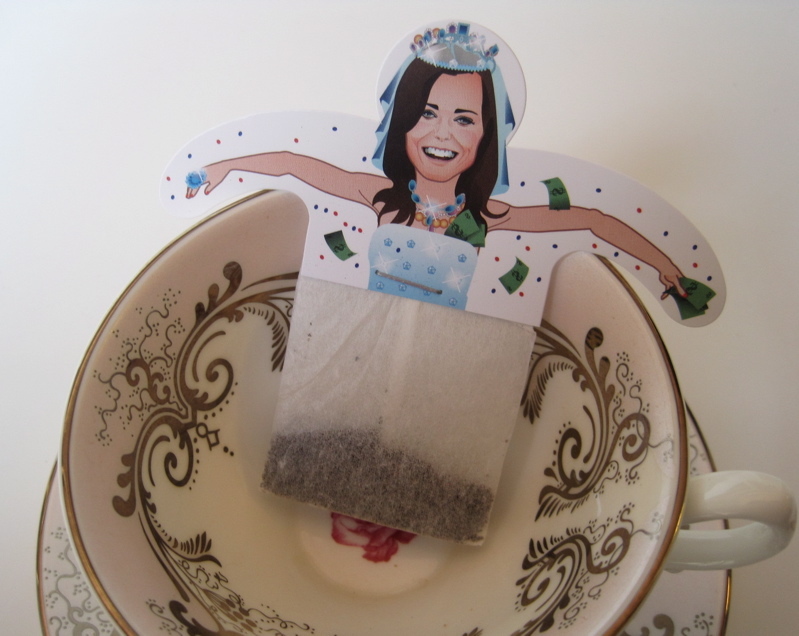 I'm not actually going to sip these teas until Friday, but I did want to let you know where I found them. Buttons, anyone? Books a Million also had these. 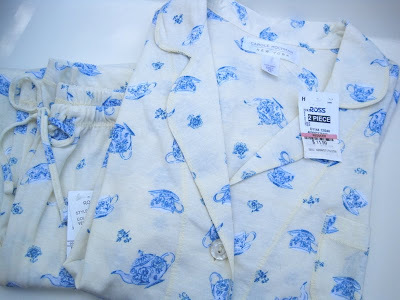 This is the one I'll be wearing on Friday, because it matches my new teapot pajamas. If I can find a matching hat, I'll be wearing that, too. 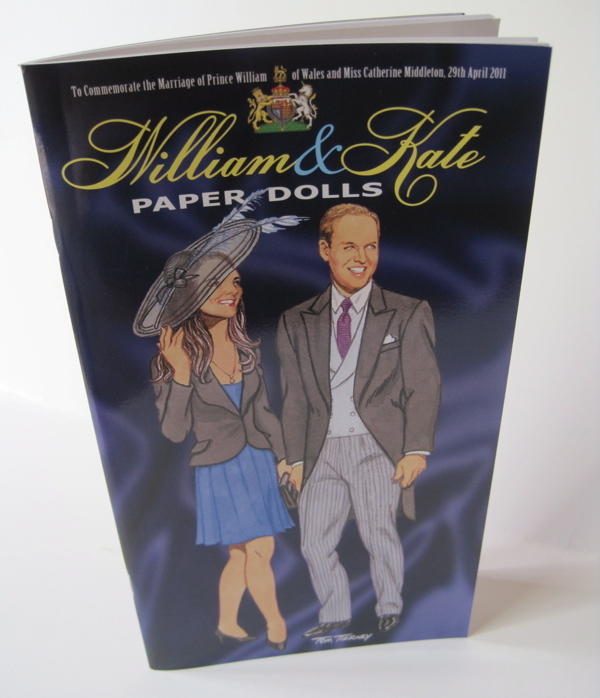 I can't decide if I want to actually *use* these William and Kate paper dolls or not. 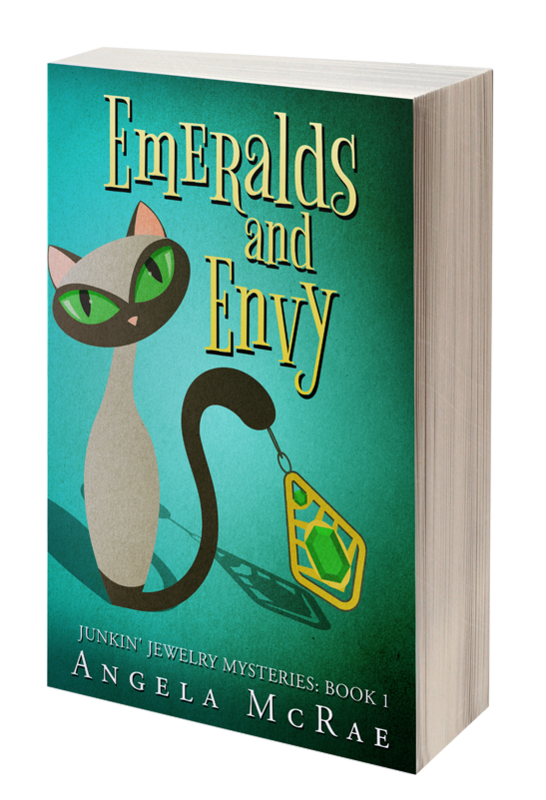 Perhaps I'll just display the book in one of the little vignettes I'll be creating. These are some of the Dover paper dolls that are so popular (I also have Victoria and Albert and Charles and Diana ones), and I love that you can go online and download the wedding outfits later. Fun! 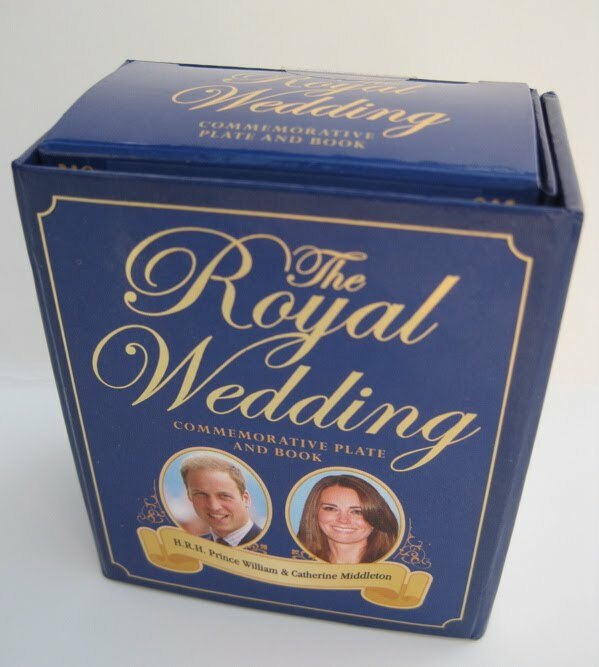 My friend Joanie found this royally fun product at Bath and Bodyworks and was kind enough to share! 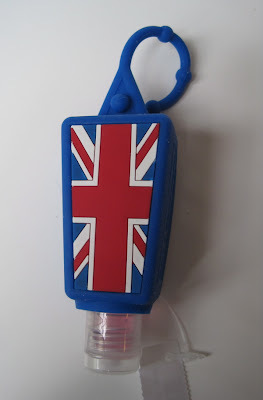 Behind the Union Jack there is a small bottle of antibacterial gel. Too cute! And T.J. Maxx made my decorating easier by offering these sweet little gift sets I'll be using on Friday. 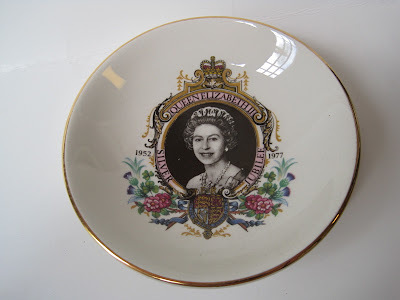 I've also pulled out this small plate I found for $1 at an estate sale last year. 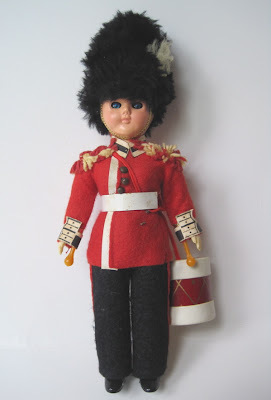 And finally, this vintage Welsh Guard doll was a Christmas gift from a friend the year I went to London. Can you tell I'm excited? 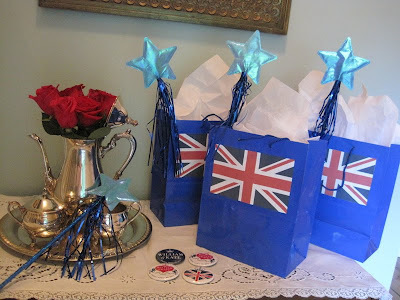 Are any of you going to be watching and/or tea partying during the royal wedding? If you're like me, you've learned a lot more about food ingredients thanks to Food Network. 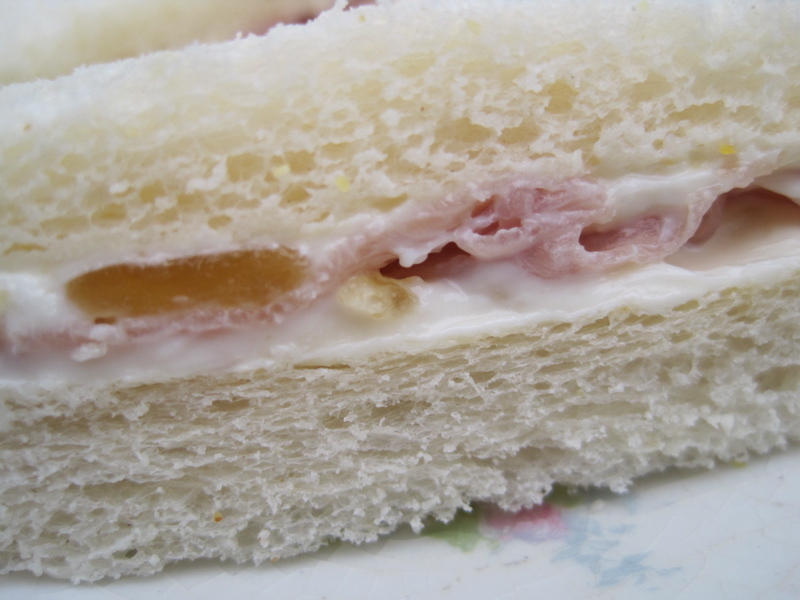 Several years ago I began to notice that prosciutto, the thin-sliced Italian ham, seemed to be showing up in a lot of recipes. 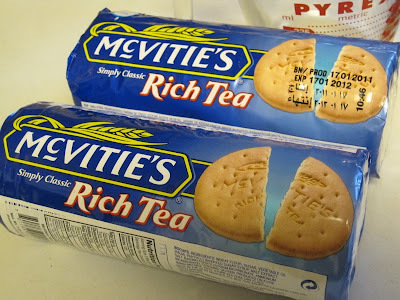 I've seen it used in more tea sandwiches too, and this week I decided to pair it with the taste of figs. I found a jar of Braswell's Fig Preserves at a local grocery store, and these preserves are nice, chunky and not too overly sweet. I loved being able to see some large pieces of the figs when I mixed the preserves with cream cheese to make it nice and spreadable. 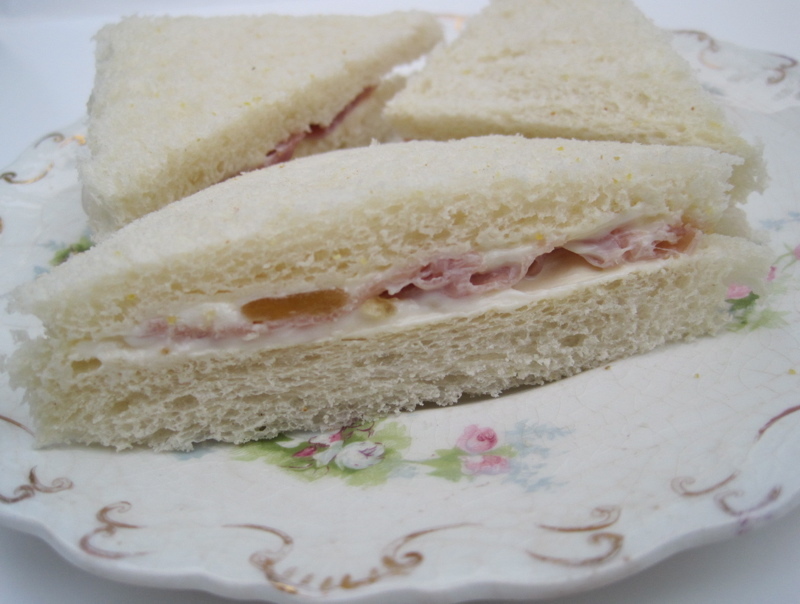 The result was a quick and easy tea sandwich that provides a nice salty-and-sweet flavor combination. 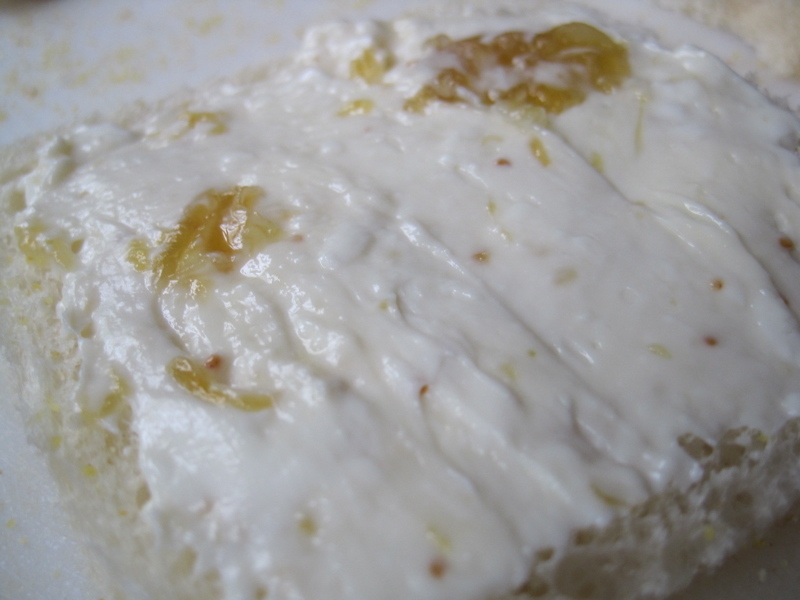 Microwave cream cheese for about 15 seconds, add preserves, and blend well with a wire whisk. Slice bread thinly into square pieces and spread with a thin layer of butter or margarine. Add a thin layer of the fig and cream cheese mixture. Fold prosciutto slice to fit onto the bread, then top with another slice of bread spread with fig and cream cheese. Slice into triangle or finger sandwiches. Yields about 20 triangle sandwiches. 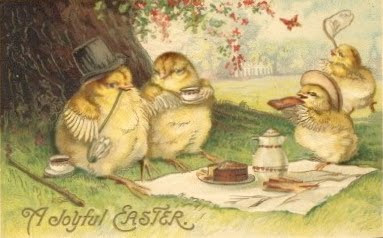 Just wanted to wish everyone a very joyful Easter! 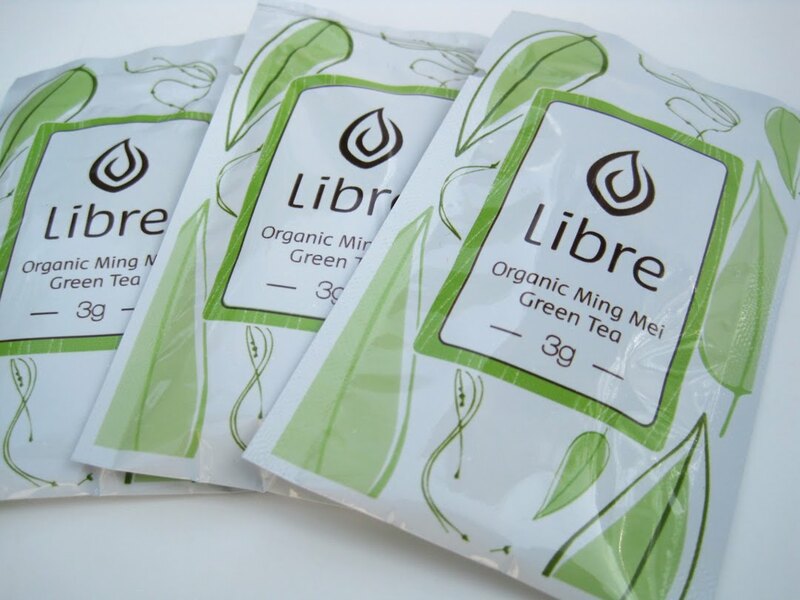 It's always fun to find a new tea product to try, but it's even more fun when a tea vendor offers to send me a sample and also provide one for a giveaway. So today, I'm happy to tell you about the new Libre Loose Leaf Tea Glass I just received and the unique way it works -- and if you agree perhaps you'd like to win one! 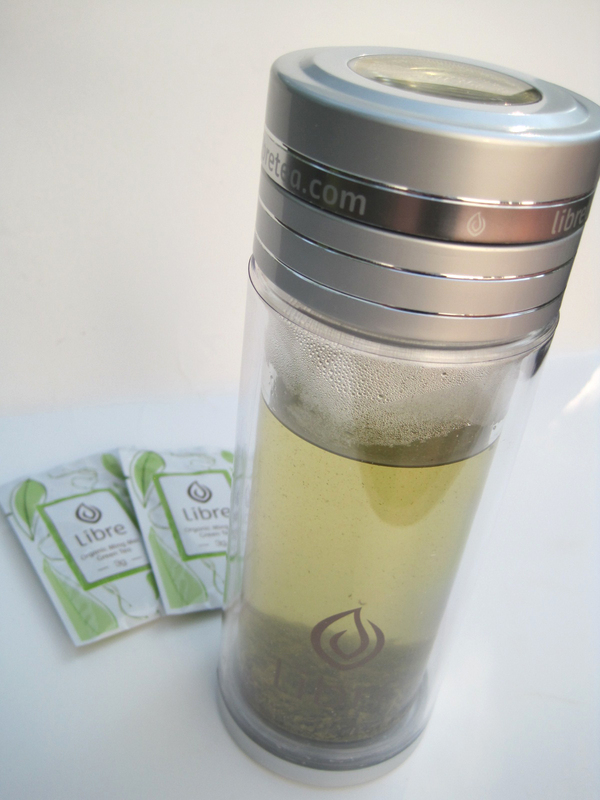 The stainless steel metal filter screws on to the top of the glass and can serve as a strainer for the tea leaves. 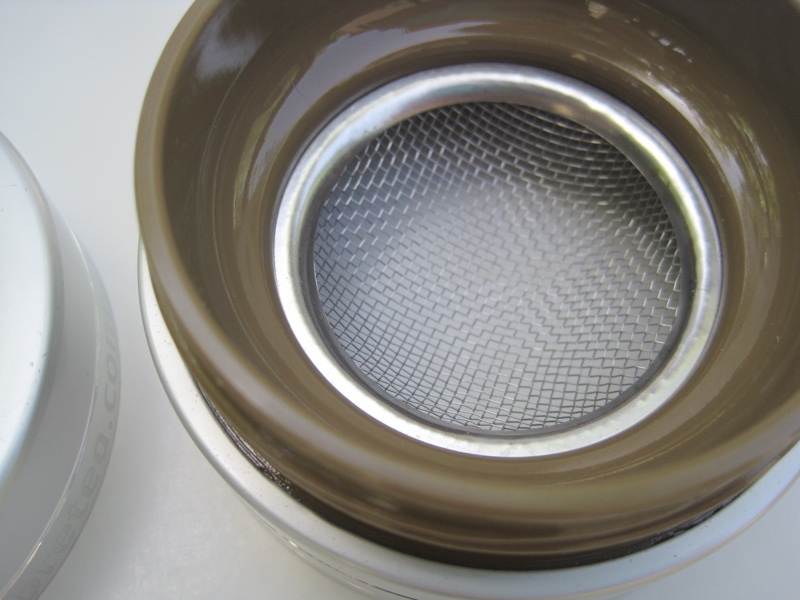 You're sipping from the rim around the strainer, so no leaf actually reaches you. Nice! I first tried it using one of the Ming Mei green tea samples Libre sent. 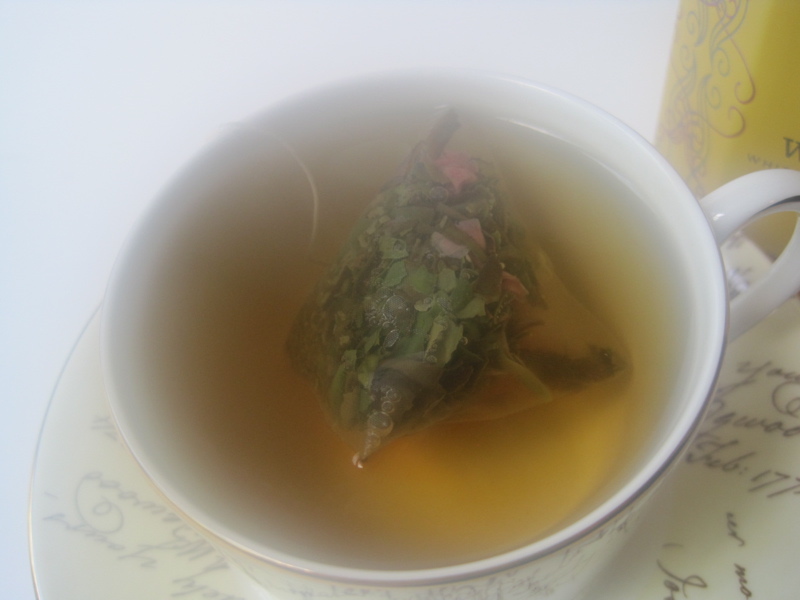 I poured the leaves directly into the glass and added hot water. It made a mild, pleasant tasting green tea with a slightly vegetal taste and no astringency, which makes this a good green tea in my book. 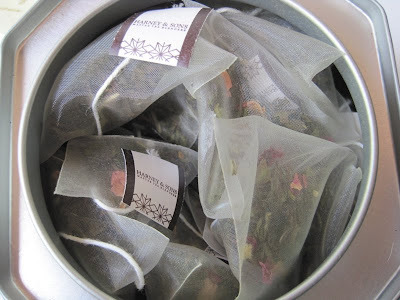 I kept the tea in the glass and then poured more water through the filter to re-steep the leaves. 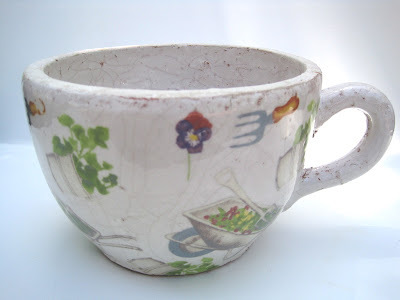 Of course, this could be a problem if you don't drink your tea fast enough and it oversteeps, right? turned the glass upside down. 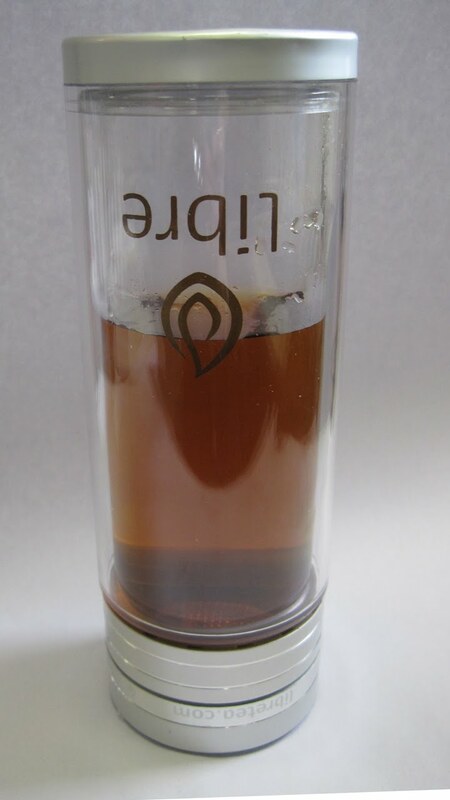 When the tea was finished steeping I turned it right side up, removed the filter lid and was able to sip out of the glass. 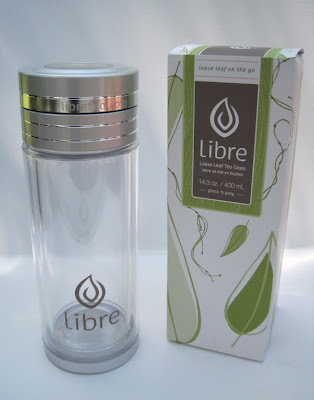 According to the company, the Libre tea glasses "are thermal and have a glass interior, a durable poly exterior and removable tea filter." Also, all the tea glasses are BPA free. 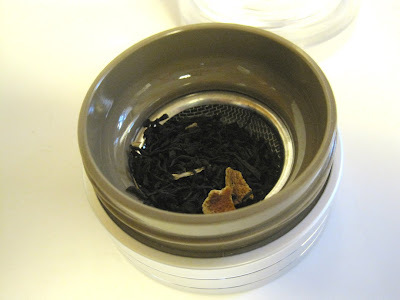 If you'd like to see a video of someone making tea using these two different steeping methods, click here. And if you'd like to win your own Libre Tea Glass (a large one!) and sample of tea, just leave a comment to this post anytime between now and Monday at 7 a.m. EST and later that morning I'll let you know who's won. Good luck! Perhaps I should stop taking those detours down the tea aisle at T.J. Maxx. 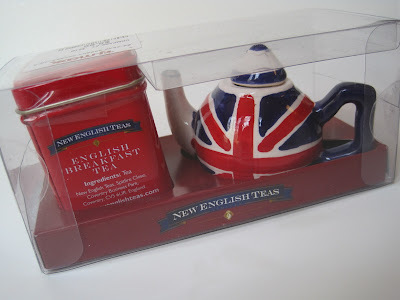 Technically I was birthday shopping for my mother, but who can pass up a quick glance at the new teas? This time there was a bottled Elisir di Rocchetta Red Tea with Peach. 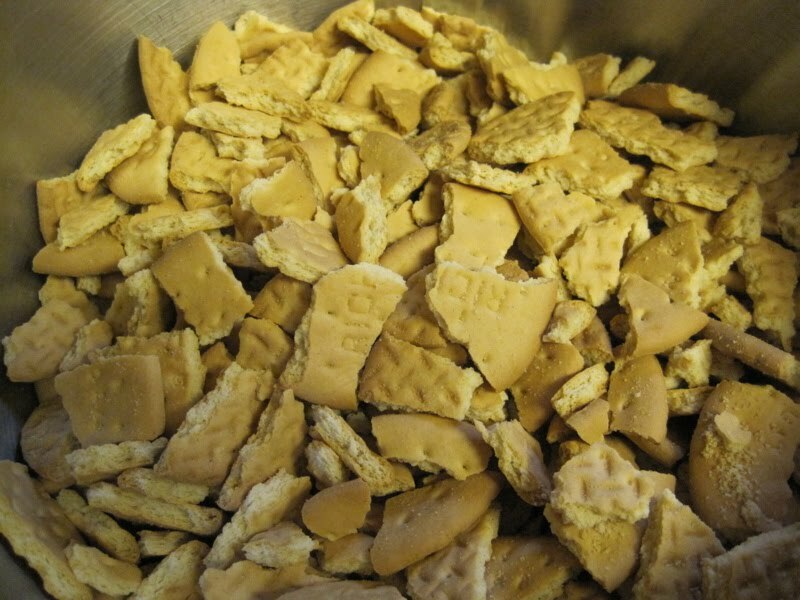 And oh my goodness, was this thing ever good! (And at $2.99 for one little 11.1-ounce bottle, it had better be!) 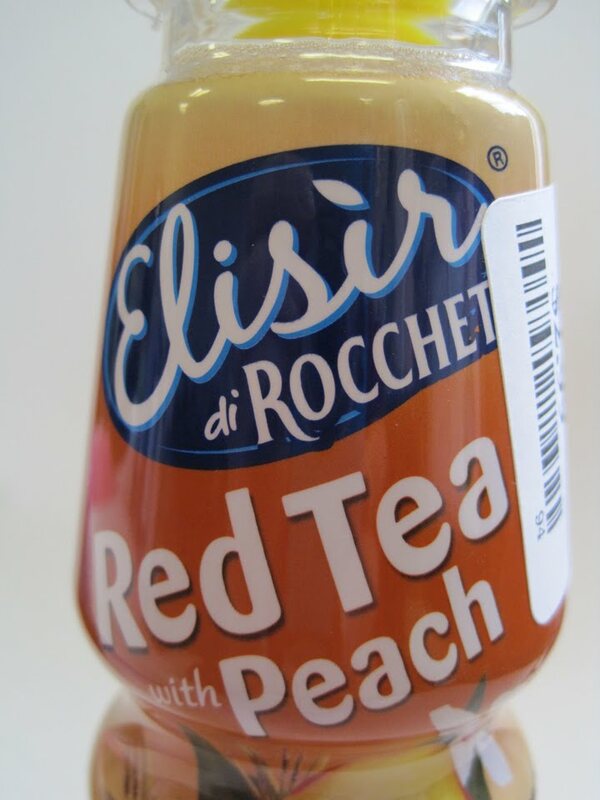 But this was the first tea I'd come across that was a product of Italy, so curiosity got the better of me. As soon as I removed the cap I got a nice whiff of peach scent, which, as a lifelong Georgia girl, I loved. And oh, the taste! 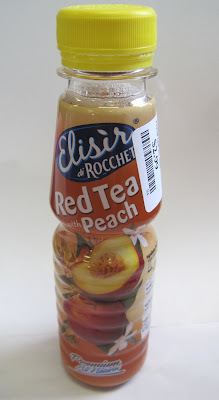 Now I haven't had a good sugary drink in ages, but I must say I enjoyed each and every one of those 24 grams of sugar in this drink. Of course it also contained red tea extract, hibiscus and peach juice, and the combination was utterly delicious -- if not exactly an everyday drink. Still I say: Mmmm! News accounts this week say that Royal Wedding fever has taken hold here in the U.S., but I already knew that just from talking to family and friends. This weekend I spent a little time thinking about the menu and decorations for my Royal Wedding Tea, and a great gift I just received will be part of the decor. 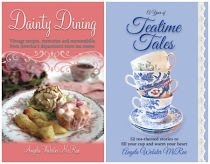 My thoughtful friend Joanie tells me they just got these mini book sets in at Hastings, a book and music store in Newnan. 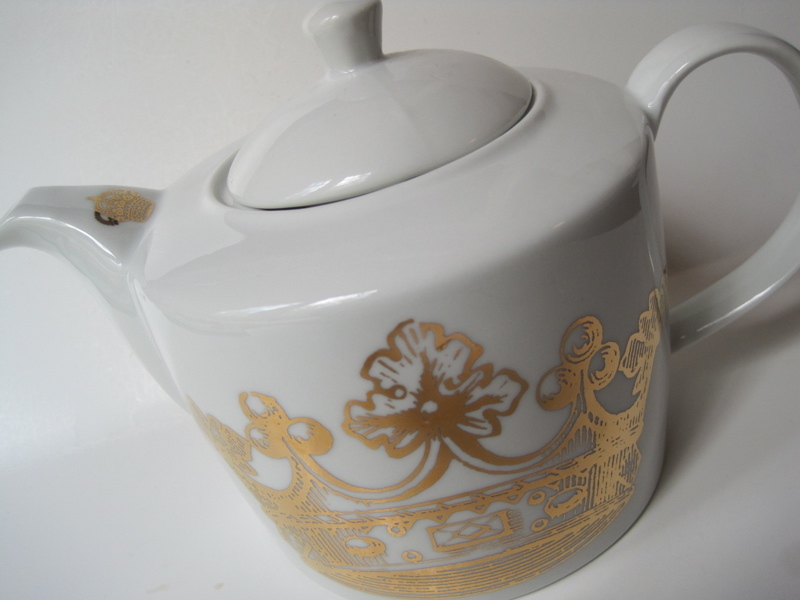 The set is by Running Press, whose tea-themed sets I have written about before (here). 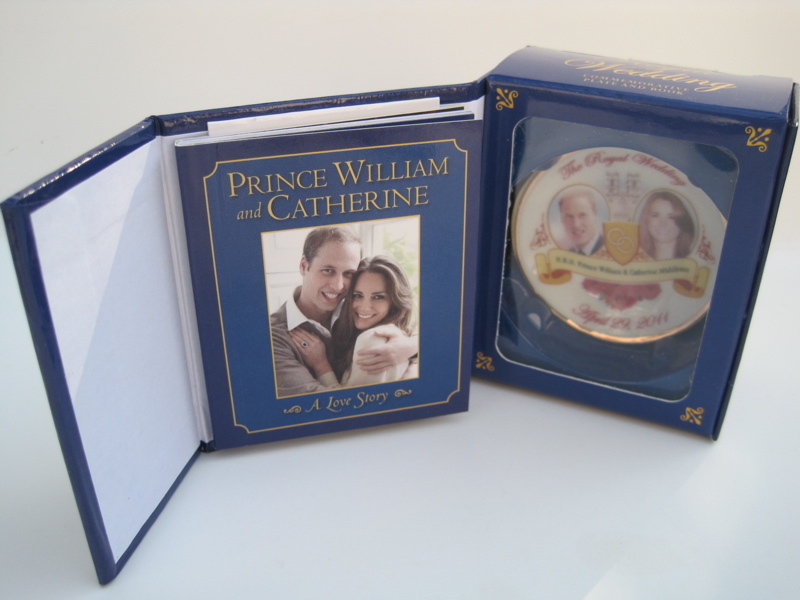 This one features a great little book that tells the story of William and Kate's courtship. My favorite item, though, is this 2-1/4-inch plate which comes with its own tiny little stand. If you're a Royal Wedding fan as well, this is definitely a set to look for the next time you're in your local bookstore! Yesterday was my sweet niece Cari's 12th birthday, so on Saturday my mom and I went shopping with her so she could pick out some of her own gifts. We were in a Ross store together when I asked if Cari would mind if I looked for tea things, and she was happy to oblige. Not only that, she was first to spot this great garden-design teacup planter, which I just loved! 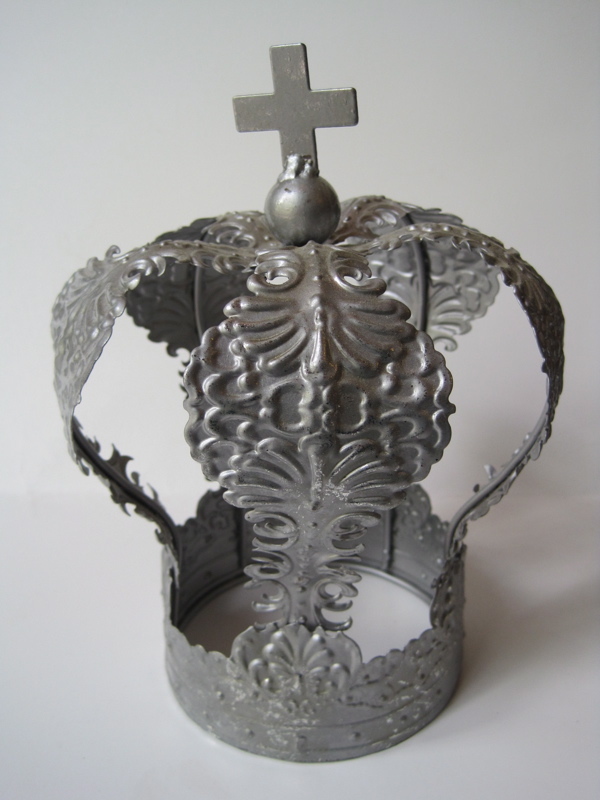 It's about 7-1/2 inches in diameter, 4-1/2 inches tall, and will make a great container for starting seeds or holding a small plant. I haven't decided yet how it will be used, but it's definitely a must-have for the tea garden. A month or two ago I saw this cute brown metal napkin holder at Ross, and of course I picked it up to check it out. I hardly ever use paper napkins in the kitchen, however, and decided I didn't really need it. Back it went on the shelf. 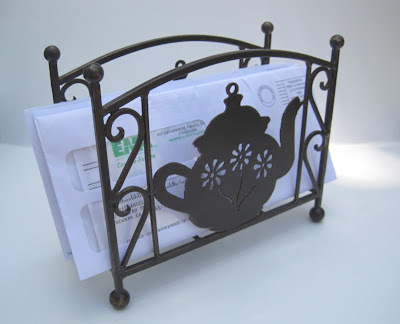 Then, a few weeks later, I began looking for a new organizer to hold the household bills, so this time when I saw the napkin holder I was seeing it with different eyes! 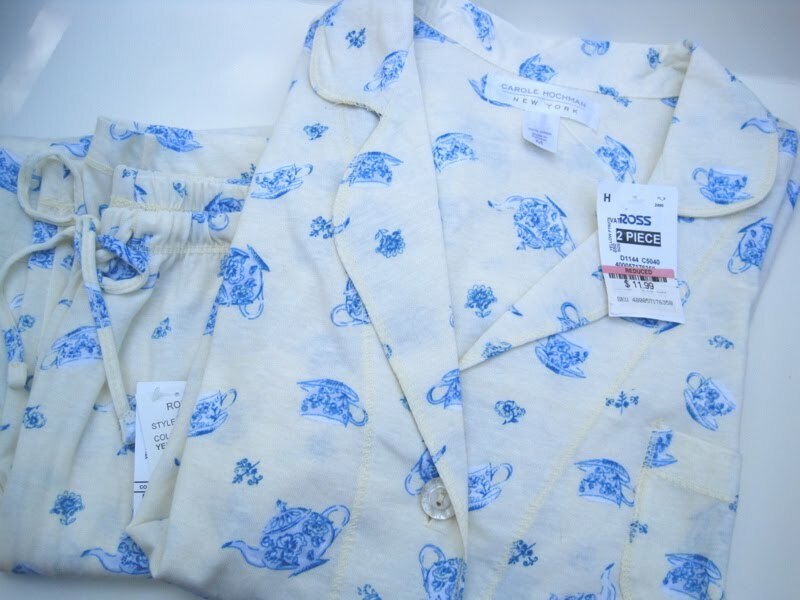 And finally, thanks to my friend ParTea Lady I knew to look for these teapot and teacup design PJ's that were on clearance. Yes! I scored the last pair, and in just my size. This, my friends, is what I plan to wear to the Royal Wedding Tea at my house on April 29. Guess who's having a wedding tea!! !